Microbe-lift MC+ for ponds 750-2000 gallons which contains Barley Straw. A 3 lb jar is regularly $54.95 for 1/2 price. Also a 5lb jar regularly $72.95 for 1/2 price. Please note: Our hours may vary due to weather & off season projects. Please call to confirm store hours before stopping by to get your winter pond supplies or order online. Hemphill's Garden and Aquatic Center "PondPals" is on Facebook and Twitter!!! 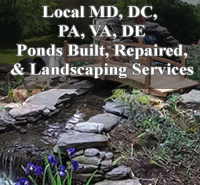 Click here for Local Pond Repairs, New Ponds Built, & Landscaping Services in MD DC PA DE VA.
Garden Pond Supplies are our specialty. in Fallston, Maryland, has been family-owned and operated for nearly three decades. We carry a full line of quality pond supplies and garden supplies in our retail store as well as through our online store. Through the years we have earned a reputation for quality service. Our Pond Supplies online catalog and store provides our customers with ponds, pond accessories, and garden supplies including: pond pumps, pond filters, pond lights, pond liners, underlayment, pond de-icers and the design and installation of water gardens, ponds, patios, walls and landscaping. We'd like to welcome you to our Pond Supply website where you can shop for Pond Supplies for your Garden Pond. We have designed it with you in mind, making it easier than ever to find exactly what you are looking for. Whatever your needs: Garden Ponds, Water Garden Supplies, or Pond Supplies - Hemphill's Garden and Aquatic Center has it ready to ship, and of course the experience to help you with any of your needs. Everything you need to design, build and maintain your Garden Pond. We offer a wide range of pond supplies at affordable prices in our online Pond Supply Store; Pond Pumps, Pond Liners, Pond Filters, Pond Water Treatment, Pond Accessories, Pond Waterfalls, Aquatic Plants, Ultraviolet Sterilizers, Pond Fish Supplies, KOI Food, Aquatic Plants, Pond Kits and more!